07/19/2018 – The Restaurant business is what brought Jack Coleman from San Diego to Oklahoma 18 years ago. First with Marie Callendars in Tulsa, then to Red Robin and Applebee’s in Owasso. He was asked once if he was to open his own restaurant, what style of food would he choose. 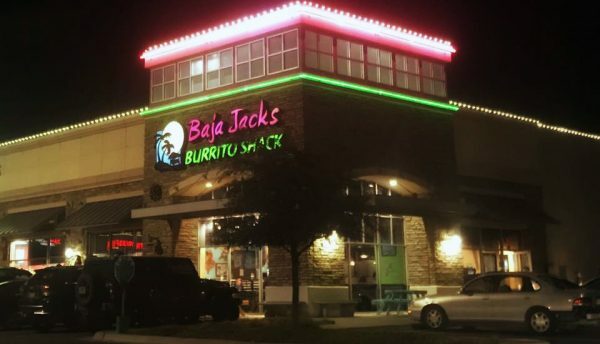 The flavors he remembered from Baja California are what he knew was missing here, and when the opportunity arose to branch out on his own, Baja Jacks was born. There was a restaurant space in Smith Farm Market, just to the north of the Applebee’s location he managed. The location had become a revolving door of restaurants. Three different restaurants in as many years had residents of Owasso saying the location was jinxed. Jack Coleman had plans to change that stigma, and change it he did… in a big way. Baja Jacks will be celebrating its 10 year anniversary in August. The tropical flavors of Baja California have become a big hit, bringing in diners from all over the area. Favorites include Grilled Carne Asada Steak Burritos, Baja Fish Tacos, Meaty Quesadillas stuffed with shredded chicken, and giant Nachos Platters. If you can not make up your mind from the menu, you have the popular option of “Build Your Own Baja”. This allows you to design your own burritos, nachos, tacos, salads and more. Everything you like, delicious every time. Baja Jacks has locations in Owasso, and at the University of Tulsa, with new locations in the works. To celebrate their 10th anniversary, Baja Jacks is hosting a big birthday blowout on Saturday, August 4th. There will be restaurant specials throughout the day, with an extended patio experience from 5-8pm. The evening will include restaurant giveaways, as well as live music from Tulsa artist Steve Liddell. A giant slide, face painting, and balloon artist will also be on hand for the kiddos. Shivers Snoballs will be serving up cool treats for Baja Jacks guests.